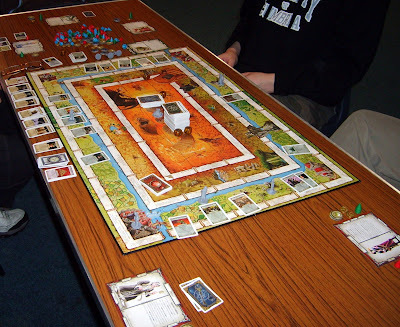 Another game of Talisman at the club, but this time with five players (Graeme, Baldy, Dave S, Colin, and me) and also parts of the Reaper expansion, leading to more mayhem and a lot of spilt blood as characters managed to die left, right, and center. 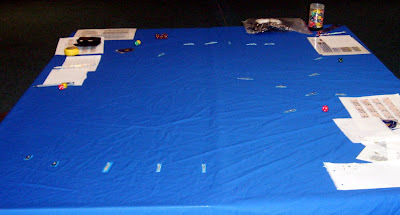 The board got jammed up with powerful creatures early on, slowing down the characters advancement, and most people lost a character before even the first Talisman appeared. 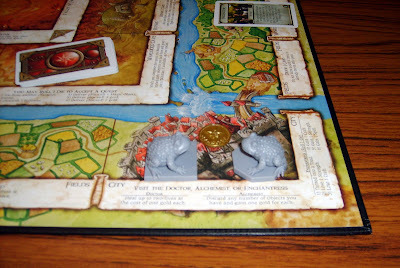 During the game a number of people got turned into Toads, and we even had some Toad on Toad action (if you pardon the expression). The left behind resources becoming nice little hordes, but none as big as that gathered by the Hunter who kept knocking out characters and building a bigger stock pile of treasure, including a couple of carts. Baldy ended up getting this mother lode of resources, but fortunately a tornado came along and robbed him of a good portion of it. This tipped things in favour of Colin who was first to get into the inner ring. Baldy bravely died trying to follow, when the Vampires sucked his life away, but no one else was anywhere near attempting the inner circle. We stood in the outer track as Colin seized the Crown of Command, and could not (and would not, it was getting late at this point) stop the inevitable life drain. Plenty of other games were on the go including a game of DBA as some one tried to convert some young GW fans with an invasion scenario. 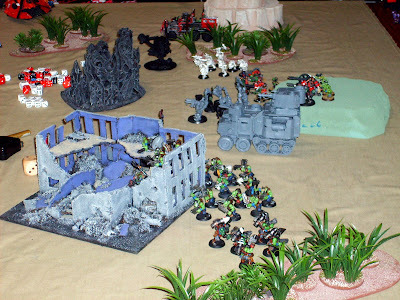 40K was on the loose as normal. And the Great War variant of General Quarters 3 was in action. A fleet engagement in the Baltic, where the Russians came out on top for once. Graeme brought along a copy of 4th edition Talisman after Colin badgered him about it. Originally a Games Workshop production it is now released under license by Fantasy Flight. I can remember playing this a lot when it was the old 2nd edition. All three of us randomly drew characters and we all started evil, Graeme the Ghoul, Colin the Assassin and Tel the Sorceress! Colin's assassination ability lead to him being avoided like the plague, but I did manage to use my beguile ability on him a couple of times. The ghouls ability to zombify defeated monsters did seem pretty weak in comparison to ours. It had to happen to someone eventually and the Ghoul finally got turned into a toad. I took advantage of his new state and managed to grab all the stuff he was forced to drop before he could reach it again when back in Ghoul form. The inner circle seemed easier than I can remember it, there is the one section where bad die rolling can send you back outside, but most of the rest are either roadblocks or minor loss of life tokens, which since I managed to grab the Runesword was not a problem for me. It was a good job I got to the Crown of Command when I did as Colin soon managed to get into the inner ring (but got kicked out by failing a strength test) and Graeme's new character, the Monk, was cleaning up all the good stuff left on the outer ring, and had rapidly built up his strength. But not his lives and with the Crown in my possession they both fell to its life draining ability, and at the same time so no one was left hanging about. The game has generally good production values and all the counters stack baring the rather cheap looking gold coins of which there did not seem to be enough; some 5gp coins might of been handy. I think the writing on the board has shrunk a bit as it was quite hard to read some of the more verbose instructions, maybe the background is different? They also obviously think that toad turning is a major thing as they have included no less than four toad figures in the set. With the later editions of the game the expansions started to get a bit silly and even included spacemen. Hopefully with future development being in the hands of FF, with their experience of expanding games such as Runebound, will hopefully keep the excesses in check. From what I can tell of the first expansion, 'Reaper', they seem to be keeping to this philosophy. Things have finally picked up at the club after the Xmas lull. Both New and returning players were present. Just the three players and only the basic game (I have all of the expansions but since both Colin and Alan were new to the game decided to keep things simple). As such we played things 'open handed' with all cards visible. We managed to get through the first couple of boards OK, but it was a bit expensive in terms of cards used. With the Moria board it might of been better to sit things out and just pick up cards. Shelob's Lair was where things really started to go wrong; the refusal of Sam to use the ring to try and avoid the black squares (die rolls) towards the end of the track and this caused some events to happen which shouldn't of and help cripple us by pushing all the characters along towards the rapidly approaching Dark Lord. We did manage to get to Mordor but never managed to get very far into it before Sauron caught up to us on the corruption track. It was a bad idea allowing me\Frodo possession of the ring at this stage as I was closest to Strongbad Sauron. Club night on Tuesday was very quiet. Ended up playing a game of the original 'deluxe' version of Illuminati by Steve Jackson Games. Dave was a first time player, both Colin and Jim had played in the past but a long time ago so everyone had to familiarise themselves with the rules. Things started quite tentatively with people building up their power structures with little interference. I managed to grab the Orbital Mind Control Lasers early and this made my future attacks to control easier. They were in a strong position in my power structure so no one tried to take it off me. Colin's money hoarders continued the march towards their victory condition after he captured a number of high income cards virtually unopposed. Jim slowly recovered his position after having his structure wiped out in the first aggressive move in the game. Jim managed to grab the American Autoduel Association which was appropriate as I store my Car Wars Card Game in the same box as Illuminati. Everybody was in a position to win but I managed to use a privileged attack to Attack Dave's lopsided power structure at its root, gaining control of the CIA and the 4 child groups, which was enough to take me over the finish line. Jim was the only one who could intervene in the attack but had already cleared out his treasury. Colin being 1 turn away from the Gnomes victory condition distracted people away from my position. Its a shame that the only expansions are for the newer full colour deluxe version. 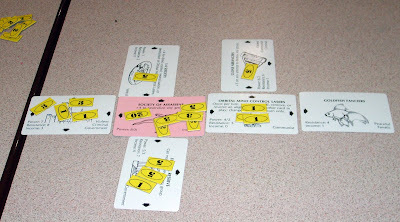 I also own the CCG version Illuminati:New World Order. Might have to arrange a single deck game so that people can compare them. 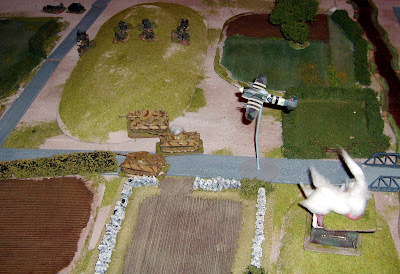 An Arnhem style WW2 Airborne landing by the Allies. 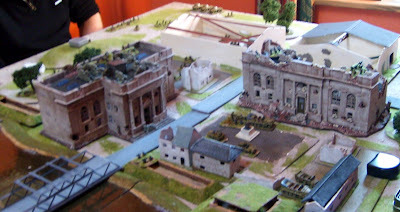 Played on Friday at Matt's using the Flames of War rules. Phil, Jock and myself turned up with Phil playing the defending Germans. The Allied forces consisted of British and American Paratroopers, as well as Glider-borne artillery and motorised scouts. The airborne landing had to be split into two waves and the decision was made for the first to go in before dawn despite the risk of losing troops in the drop. Since there was no formal rules for drops in the books that we had, the old\traditional 'paper chits dropped from height' rule was used. A view of the combat zone. Both bridges need to be taken and held till reinforcements (hopefully) turn up at the near edge. 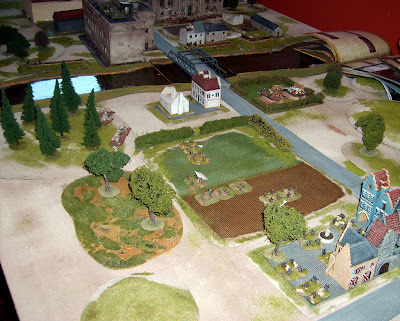 The first choice of drop zone, between the bridges but near trees and a built up area, turned out to be a bad one as the landing was opposed by two groups of Jerries, including a Luftwaffe ground unit holed up in the buildings near the first bridge. The paras did a limited amount of damage before being removed; An enemy Forward Observer being a particular nuisance by calling fire down on them. The troop from the second drop zone were more successful and attacked and seized a position near the second bridge, despite coming under intense fire from across the river they managed to dig in. A fairly conservative and safe choice for landing zones for the Gliders. Given that the vast majority of this force was mechanised being dropped this far from the action was not thought to be a problem. The landings were semi-successful but we did manage to lose the only 17pdr gun so there was the potential for trouble if enemy tanks did turn up. Four turns after the first the second wave of British paratroopers arrive and land in relative safety between the two bridges unopposed by the defenders. A risk was taken with these and they dropped next to the town itself. Jocks final idea before he had to scoot. It turned out to be a good one despite a Mechanised Scout unit, equipped with a number of Pumas, turning up nearby a turn later. 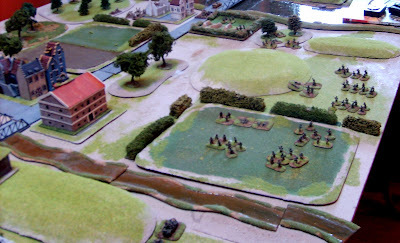 Despite have a load of artillery pointed at it it seems that the only way to take such a position in the rules is to assault it with infantry. Used some mortars to put smoke onto it to restrict its range of fire. For indirect artillery you need to make a targeting roll each turn even if targeting the same position as well as rolling for effect; which is something I found strange. The Bazooka equipped Americans deal with the Pumas and advanced into town. 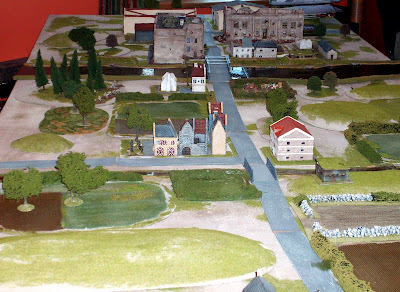 They seize control of one of the suburbs, and enter into a prolonged exchange with the Germans across the square who were now reinforce with a Jagdpanzer. 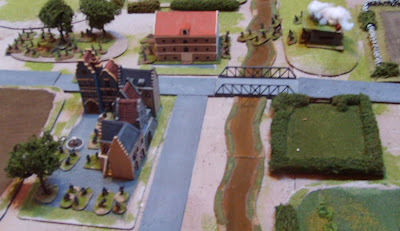 The Brits finally took out the bunker holding up the forces at the first bridge. A rear assault did the trick. 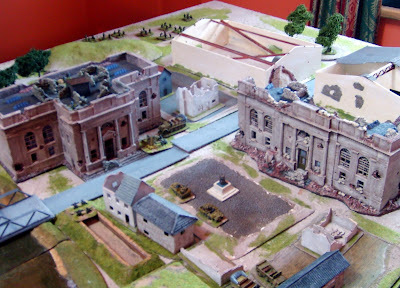 With that out of the way they quickly advanced into close combat with the enemy in the buildings either side of the road and seized control of the first bridge. The German Tanks finally turn up retreating from the collapsed front line. They initially advance towards the first bridge and cause panic amongst the light artillery who mount up and move away. 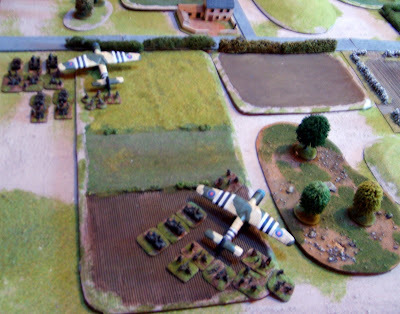 A few turns later the pursuing British armour arrive and the Panzers decide to turn and face them; much to the relief of the Paras who only have P.I.A.T.s to stop them. The game was winding down at this point so we decided to try out the Aerial Ground attack rules and sent in a Typhoon which successfully took out a panzer with its rockets.